Spend the day on Appledore Island, one of the nine beautiful Isles of Shoals off the coasts of Maine and New Hampshire, and visit the Shoals Marine Lab. Travel out to Appledore on the University of New Hampshire research vessel, the R/V Gulf Challenger, with UNH Marine Docent tour guides. Investigate the intriguing intertidal creatures and zooplankton collected from the ocean at informal science stations. 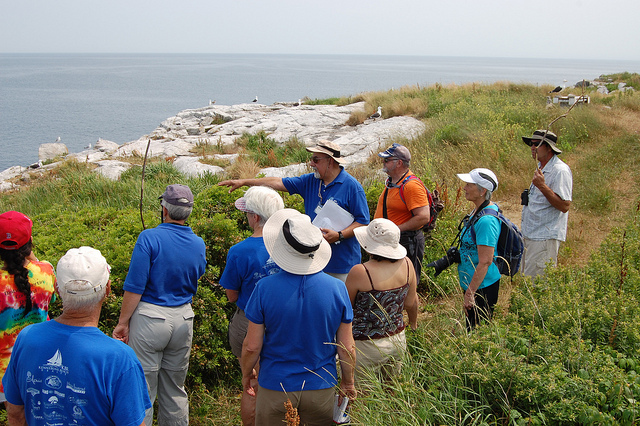 On Appledore, explore the natural history of the island with the Docents. Look down to magnificent rock formations of eons past and up to a sky filled with birds that live on the island today. Learn about the plants that withstood the salty sea air to provide colonial settlers with remedies and today supply nutrition for the long voyages of migrating birds. Discover the important role the Shoals played in the fishing economy of the 17th century. Find out about the amazing resort hotels on the Shoals in the 19th century and the people who flocked to the Isles for the healthy sea air. Visit the recreated garden of famous poet and essayist Celia Thaxter, who once lived on Appledore, and learn of her family's life on the Shoals. Visit the main laboratory of the Shoals Marine Lab, the largest facility for undergraduate study of its kind in the world. Learn how students at the lab delve into the intensive study of the marine world and how you and your family can take a course there. Open to members of the public on a first come, first served basis. Children 10 years of age and older are welcome on the cruises when escorted at all times by an adult. Cruise guests must accompany Marine Docents at all times on the Appledore tours. All cruise guests must be able to walk several miles. Terrain of the island requires moderate hiking exertion. $50 per adult, $40 per child (10 through 17). Price includes round-trip boat transportation and guided tours of Appledore Island. Food/beverage not included. Walking Tour participants should plan to bring a small bag or backpack with a bagged lunch and a drink or water bottle. Plan to arrive at the UNH Pier between 8:00 - 8:30am for check-in and orientation. The trip will depart for Appledore Island at 9:00am. Cruises return to the pier in New Castle by 2:00pm. Cruises depart from the new UNH Pier facility (Judd Gregg Marine Research Complex), which is next to the U.S. Coast Guard Station at Fort Point in New Castle, NH. Parking at the dock is limited. If you are traveling in a group, please make every effort to carpool. Price includes round-trip boat transportation and guided tours of Appledore Island. Child price for ages 10-17 years old.